We only see the students once a week for a short period of time. Over the years I have tried various systems to help encourage positive behavior. I've used sticker charts, rewarded points and given out awards for the class of the month or the class of the advisory for each grade. My most ambitious idea did not work like I had envisioned. I found the idea on Pinterest (of course). 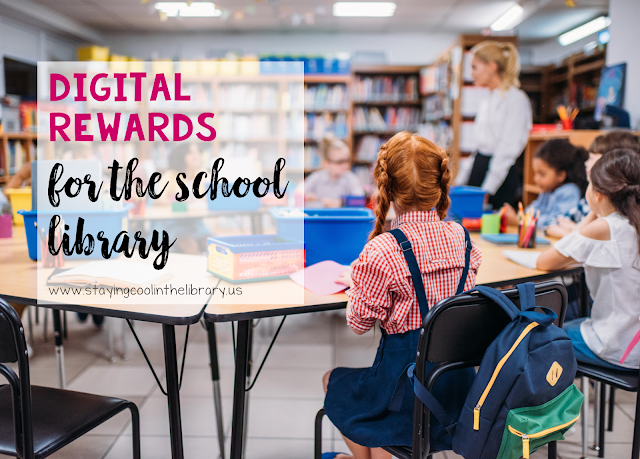 Each time a class came to the library they would earn marbles. The marbles would go into a jar. Each class had their own jar. When the jar was full the class would earn a prize. I was so excited to implement this. I went to Wal-Mart and bought mason jars. I had my husband put a hole in the lid so the marbles could go in. I realized that marbles would be too expensive so I used beads instead. I bought thousands of beads from Oriental Trading. I labeled the jars and was ready to go. The problem was that I saw 30 classes a week so I needed 30 jars. I then needed to find a place to display the jars so the kids could see them. The only place I had to do this was the top of the bookshelves. I introduced the system to the kids and they were excited about it. But as the school year progressed, the students became less interested in earning beads. It took forever for the beads to fill the jar which didn't help. I forgot to add beads to the jar until the class was over. And when I held my first book fair I had to move the jars to make room for the fair and had no place to put them. I finally just gave the jars away and had the kids make necklaces and bracelets with the beads. A couple years ago my school started using Class Dojo and it was an expectation that every teacher used it. But some teachers refused to use it, other teachers had very different ideas of what a child should earn or lose points for and quite a few teachers never added me to their class so I couldn't use it at all. 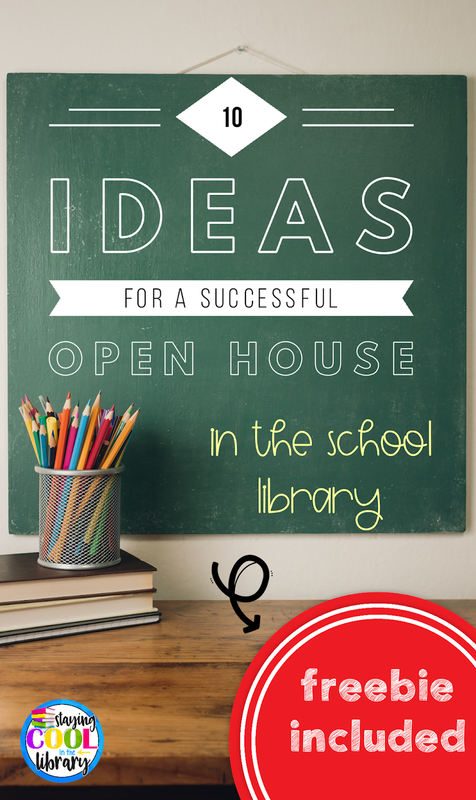 This is when I started to think of a way I could do something similar just for the library. I needed to find something that was easy to manage, that didn't require a lot of paperwork or sticker charts to keep track of. I knew digital was the way to go. So I created a series of Google Slides. I would be able to display the slide on the SmartBoard when the class was in the library. I could minimize it if needed and bring it back up quickly. The students could easily see how many points they were earning and each class could work toward a different goal if need be. 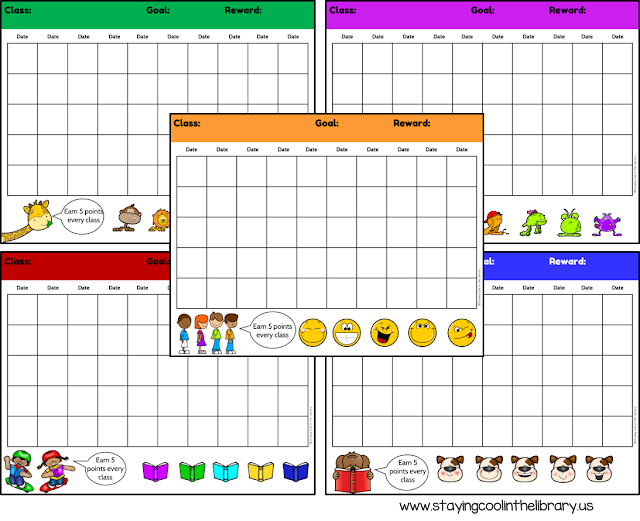 I could also assign a slide to just one student to use as an individual goal chart. I created 15 different slides. The first 5 slides would work better for younger students or individual students. Slide 1: Bookshelf and books. Each time a point is earned one book is moved onto the bookshelf. Slide 2: Gumball machine: Each time a point is earned one gumball is moved into the gumball machine. Slide 3: Ice cream and sprinkles. Each time a point is earned a sprinkle is moved onto the ice cream cone. Slide 4: Lemonade and lemon slices. Each time a point is earned a lemon slice is added to the jar of lemonade. Slide 5: Fall tree and leaves. Each time a point is earned a leaf is added to the tree. Decide which slide you want to use. Type in the class name, goal and reward. Then when a point is earned move a picture over. In the example below move a book over to the bookshelf for each point earned. If you need more books just copy and paste them. Slides 6-15 are a chart system. There is a table on each slide. The table has 10 columns. Under each column are 5 boxes. The class can earn five points a day. For each point, an image is moved into the box. All text on the slides can be changed. The only pictures that can be edited/moved are the ones that go in the boxes. In this example, an emoji is moved each time a point is earned. I stacked all the emoji's on top of each other to save room on the slide. There are 10 emoji's in each stack. Again, just copy and paste if you need more. The best thing about this resource is how flexible it is. You can use these slides in a variety of different classes and grade levels. And you can use it year after year. You can purchase them from my website or from my TpT store. One of the most important lessons I teach every year is book care. 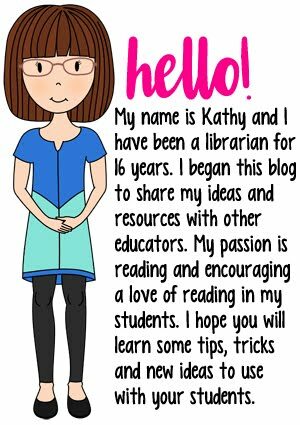 When I first started as a librarian I did not spend a lot of time teaching book care to my students. I assumed that all kids knew how to take care of their books, but I was sadly mistaken. 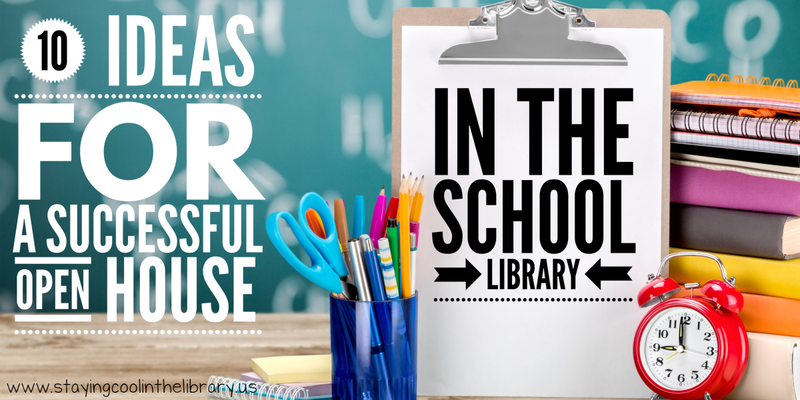 Many of my students did not have books at home and rarely visited the library outside of school. So I quickly learned just how vital it was that I teach these skills to my students. 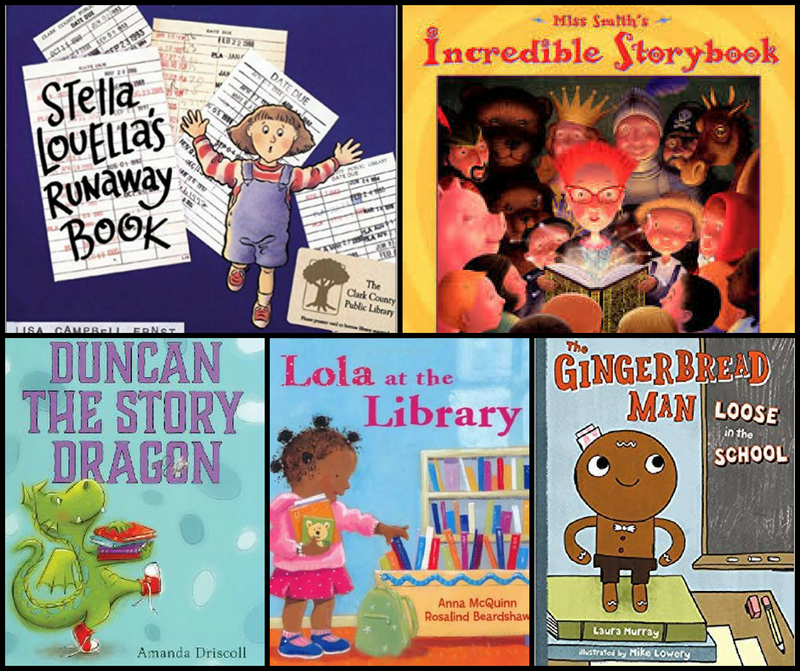 My goal became to teach book care in a way that went beyond just repeating the rules over and over again like a broken record. Over time I came up with different ideas and activities that work really well. 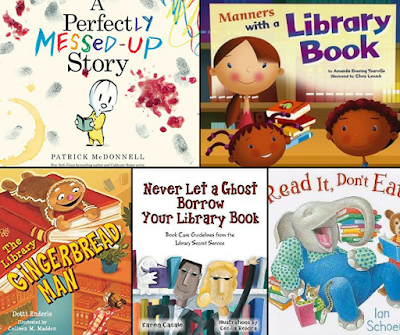 A Perfectly Messed-Up Story by Patrick McDonnell - Little Louie is happy to be telling his story in his own book, except when he realizes that the book is messed up. There are jelly stains and scribbles and all kinds of messiness. This is a fun and interactive way to teach children book care rules. Read It Don't Eat It by Ian Schoenherr - Simple, rhyming book that reviews different book care rules in a fun and engaging way. Manners with a Library Book by Amanda Doering Tourville - This is a nonfiction book with colorful illustrations. 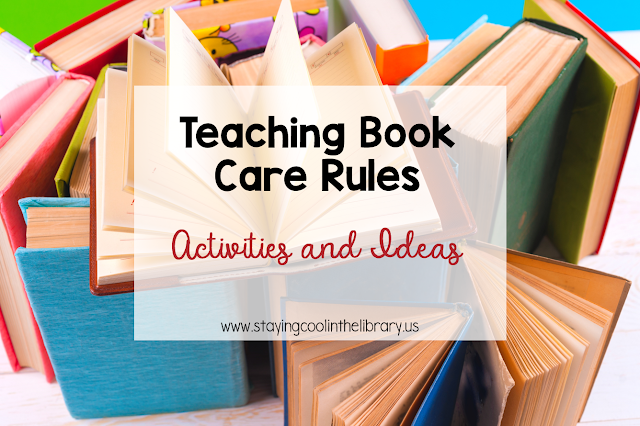 Demco sells a few different books that work well to teach book care rules as well. 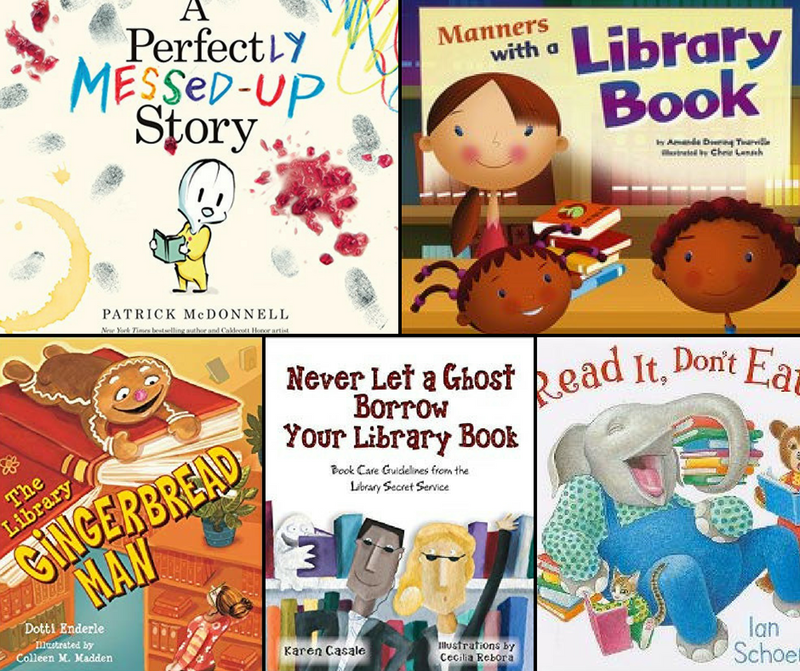 Never Let a Ghost Borrow Your Library Book - this is a good choice for second and third graders. Mr. Wiggle's Book and What Happened to Marion's Book are excellent choices as well, however, you may have trouble obtaining a copy. There are some other books that I will read at the beginning of school. 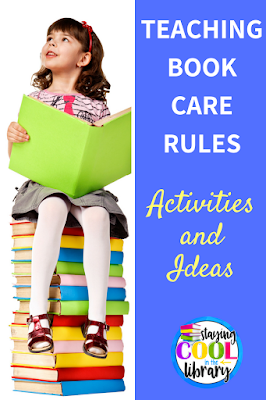 They are not specifically about book care rules but it is very easy to begin discussing book care rules after reading these books. This activity I use every year. I take a tote bag and fill it with different items that are related to book care rules. Then I have a student come up and pull out one item at a time and have students guess what book care rule the item goes with. Below is a list of some of the items I use. Sometimes I will also have two different boxes (book care do's and book care don'ts). After students identify each item they will decide which box the item goes into. Another variation that I will use is a book care sort. I will use a pocket chart or a magnetic whiteboard and have students sort pictures or short sentences into two different columns. 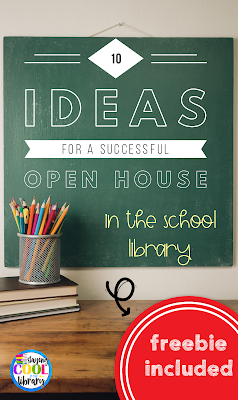 This also works really well as a center activity or for students to do after they check out their books. 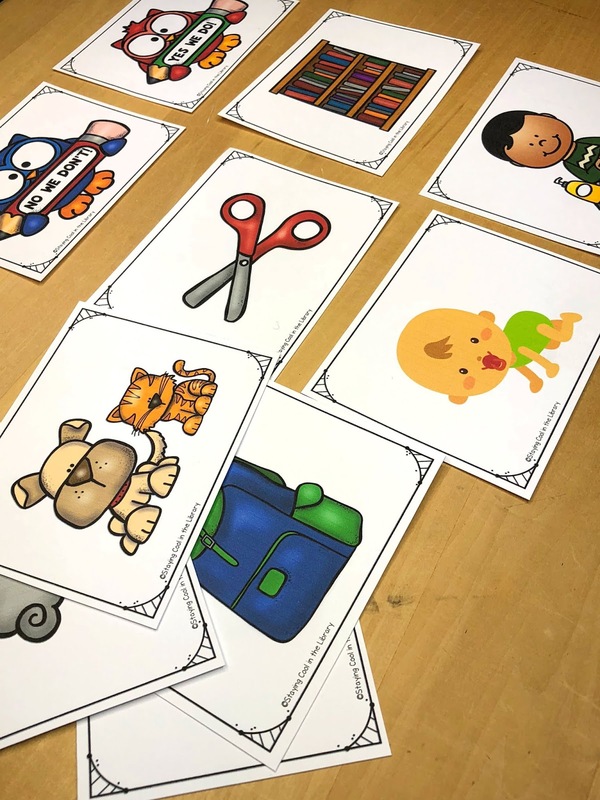 Sometimes I will give one card to each student and have them group themselves into the two categories. I will also pull this activity out midway through the year as a review, usually after Christmas. 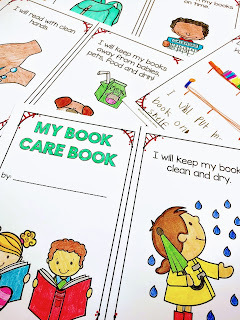 This sort is part of my Book Care Activities Lesson Pack. 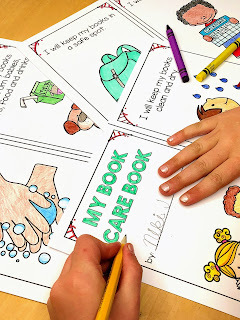 Another activity in my Book Care Activities Lesson Pack is a mini book. I love using mini books with my students (even though it can be a pain to get 100 mini books ready for an entire grade level). One advantage of using a mini book is that the students will take them home and show their parents and they will read it together. This also helps to showcase what we're doing in the library. You can also show students examples of books that have been damaged. 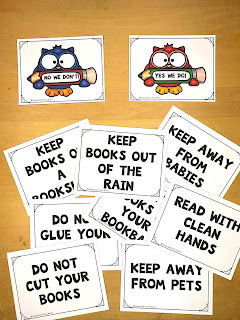 We talk about what happened to the book and how to protect our books. You can also show students your "book hospital", supplies that you use to repair books. I am really excited to use this last lesson with my students next year. It is a book care sort that I just created to use with Google Slides. I have not used Google activities with my younger students yet so I am anxious to start and see how it goes. I plan to do it as a whole-group activity on the SmartBoard to start with. Then as we all get used to using the Chromebooks and Google Classroom I will assign it to them to work on during centers or free time. Below are what the two different slides look like. 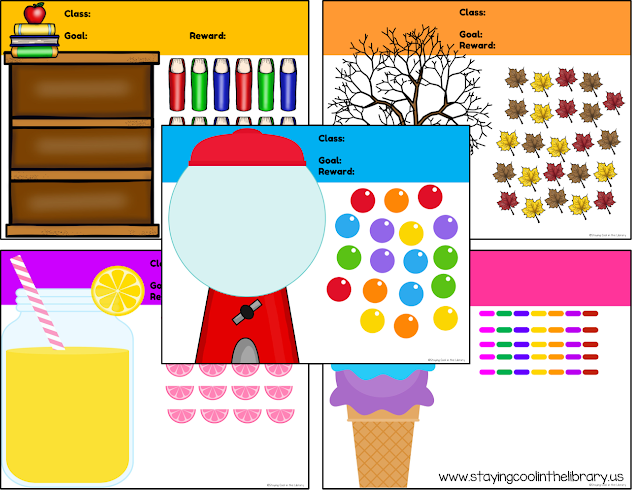 This activity is part of my new Library Skills for Google Drive - Grades K-2. 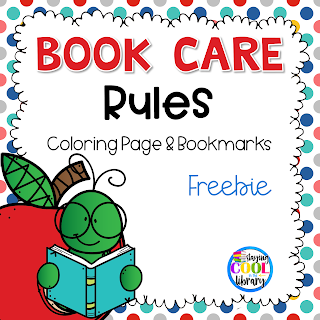 I also have this free Book Care Rules coloring page and bookmarks available in my store. 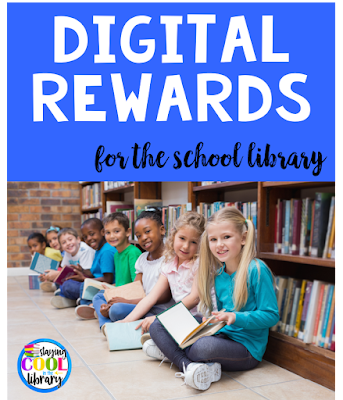 This is a great way to reinforce book care rules all year long. 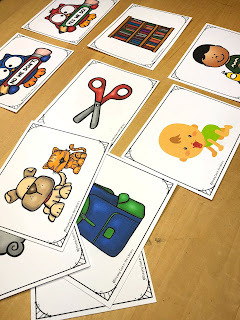 All of the products in this blog post are available to purchase from my website or my TpT store. Something to think about: I also tell the students that accidents happen. Sometimes a puppy will chew a book up or your sister will spill her milk on your book. When something like this happens, they need to be honest about it. I tell them that we will work something out, and not to be afraid to tell me about it. I know many of my students can not afford to pay for a damaged book and this is a worry for them. This happens more with lost books. In my mind, I would rather the student take responsibility for what happened then to lie about it or hide it. What are your thoughts on this? Drop a comment and me know. I always like to hear opinions and ideas from other librarians.